Manos Wild (real name Manos Katsampoukas) was born in Thessaloniki , Macedonia -Greece on September 6, 1980. A part from that Manos studied Greek Orthodox Chrurch spiritual music (called Byzantine music) and after 8 years he received his diploma as a music teacher. His teacher is Ioannis Tsamis a well-known chanter of Thessaloniki and Conductor of the Byzantine Chorus "Idymelon". Manos also performed as member of that same Chorus in various appearances. 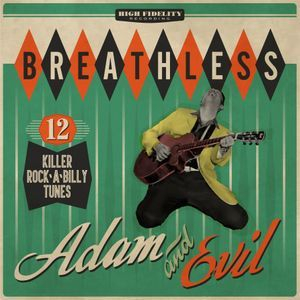 At the same time he started guitar lessons by guitarist Johnny Iron with whom they formed a new Rockabilly band by the name of Breathless..
Breathless were formed in 2003 and they combined fifties Rockabilly sound with '70s and '80s revival Rockabilly and Teddy Boy music. 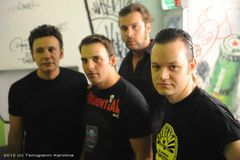 The have played live countless times all over Greece, they appeared 3 times in Greek TV and gave numerous interviews on Radio , Internet and TV. Their debut album "FIRST TAKE" was released on July 2008 by OnStage Records while their second album is planned to be released within the next months! At the same time with Breathless' appearances and recordings Manos Wild turned his own place into a small studio and that's where he started recording more and more of his own material. As he found impossible to release all his compositions with Breathless (because of lack of time, the number of songs that kept growing and because many of them were ballads or just covers that he always wanted to record for himself (sometimes swing/jazz material , Orchestral themes or Easy Listening songs that were strange to the Breathless raw rockabilly sound) he started to produce his own recordings from home . This condition was improved and many of his recordings were half recorded and produced on his own studio and half recorded in outside professional studios when he needed to record other instruments for his productions (violins, Saxophone, trumpet and more). Manos performs live only as a member of the group Breathless. You can find all the details and all their upcoming shows in Breathless' official Facebook page listed above.